Charts can be very useful for capturing complex data and making it understandable. They're also very easy to use maliciously (or stupidly) to mislead and dramatically exaggerate differences. This chart (source) is such an example. The leftmost green bar is 362 pixels tall, with a fairly tall point at the top. The rightmost blue bar is 52 pixels tall, with a somewhat flat point. This suggests the site with the green bar (a nice, warm, winning, "green means go" color) has almost 7 times as much traffic as the site with the blue bar (a cold color). But if you look at the actual numbers at the top of each bar, you'll see that the short bar (6.149M) is only 2.3 times shorter than the tall bar (14.340M). That's because the y axis conveniently doesn't start at zero. The net effect is a 3x magnification of the actual difference. Yet the chart maker can still safely claim they're not lying, and indeed they're not--the numbers are right there, undoctored, for all to see. But the damage from the giant visual difference is already done. Shrinking the scale of a chart like this so it doesn't start at zero is dishonest. Chart junk like fake-3D bars with taller pointy tops on taller bars only makes it worse. 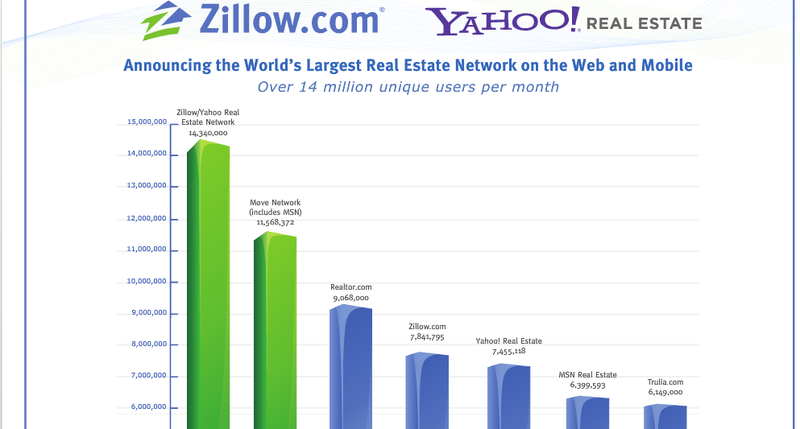 Zillow, you should be ashamed of yourself. Maybe your chief economist could come forward and disavow this piece of agitprop for what it is. Disclosure: I led Trulia's Data Services team until August, 2010. I no longer work there, but still work on producing accurate data that informs and doesn't lie. totally agree, spinning the way data is presenting to make you look bigger is just plain wrong.